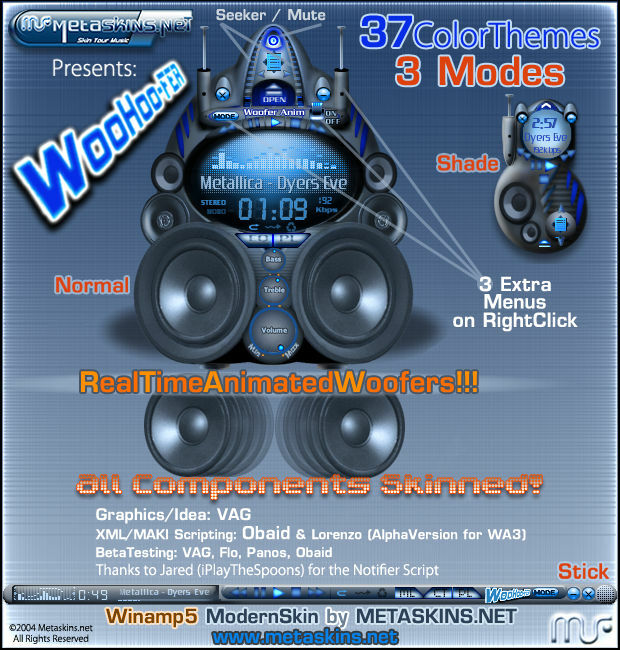 Metaskins Team presents to you WooHoo-FER a Winamp5 (5.02+) Modern Skin. Real time ANIMATED WOOFERS, 3 modes ( Main,Shade,Stick ), 37 ColorThemes and extra menus to customize the skin's functionality. Animated antennas with 3 modes to choose. 2 Different ways to have woofers animated based on different scripts. All Components Skinned!. Notifier Add-on script, thanks to Jared ( iPlayTheSpoons ). Beta Testing: VAG, Flo ( RontZ ), Panos ( Anemovatis ), Obaid ( CarlosP ). After GUI Olympics you can find us at www.metaskins.net. © METASKINS.NET 2004, All Rights Reserved ® 2004 by Metaskins Team. That is one bad assed skin!! Extremely well made animations, plus heaps of othe snazzy stuff. Top job! wow....great work....this is the first skin that makes me think on download winamp 5 (i use 2.9) only to try this babe !! wow...very good stuff indeed. and i love the now playing flash screen on a new track.. WOW!!!Fantastique!! !i love the ANIMATED WOOFERS. one of the winner for me !!! thx for your great comments. i hope you all like the skin. i am glad we have most of the best winamp skin here which was made this year. hope we get more such good stuff. thank you. It's too big. Just too big and pointlessly cluttered. Lower than H2O in my books... you can't please everyone. Alpha Drone TOO BIG??? Do you not know that the skin has 3 sizes to chose from large, med and small like most other WA5 skins. Okay, The main mode is too big. The mini mode is cluttered and... dark. The stick mode is OK, but still suffers from darkness and the "woohoo-fer" banner. Just not my type. Impulse and D-R are more my thing. Anyway, when will we see a skin top Cardium II's notifier? the notifier from caduim II is perfect and no one will make a better one in the next time. We have 37 color themes and there are any kind of themes. Dark ones, bright ones and many other. The skin has three modes and there should be a mode for everyone. If you find the skin too big try the stick or shade mode and try out some color themes and i am sure the skin will satisfy you. Thanks for the rant my friend. and maybe you have to start thinking of a bigger Monitor or higher resolution???? PS:Thanks for the rest of comments people Enjoy! Gah... I am hated. Anyway, technically this skin is very good. But it's the graphical direction that is not very appealing to me. There's too much 3D going on in the main modes, and too little merging and 3D in the buttons. Also, you integrated the Thinger into the main modes, which wasn't a very good move IMO. The stick mode is not that bad. In fact it's quite good, but the buttons... So, as I was saying, it's the excessive 3D, bevel and graphical clutter that is annoying, in the main modes. Of course, the woofers themselves are amazing. Also, why is it that the antenna goes up with decreasing volume in Main mode and down in shade mode? PS: I'm working on a 17" monitor at 1024*768. Not great, but not bad either. Anyways, if you can actually delete a comment, then feel free to delete mine. Alpha Dome I can't and I won't delete any of the comments my friend cause we have DEMOCRACY. There are 3 Modes in the Main Skin Antennas animation witch I also say on the description text. Just right click on the antennas base (to see and test the rest 2 modes), and on the switch (ON/OFF) for the woofers animation do the same and see also another option that is there. And I don't hate anyone my friend, I just try to be clear and justice and better FIRST investigate and then come back and say anything on any skin's comments and elsewhere. And finaly FYI, If you take a tour in WA Forums you'll see that this skin was designed April 2003 (like H2O) and Alpha Version coded for WA3 - nothing else to say for the skin. we are all artists and one thing each of us know is that you can never make a peace of art which everyone likes. there are always people who dislikes what you do but thats ok because as long as the major part of the users like our work we did a good job. so what, lets enjoy these skins indifferent if we like are dislike them! I believe the purpose of the GUIO is to let people show the community their creativity, not create skins for the masses. While I may not like the style of Picasso, I can still appreciate the creativity that went into the painting. I applaud all the skinners for their abilities and their enthusiasm in giving us the opportunity to CHOOSE what our apps look like. Very interesting player, specially love the speakers. Always loved the dark look for speakers more like techno, don't know weither because of diaphrams or speaker grills/mesh normally see. Certainly has a futuristic style I love about it. love this skin and all the xtra bells and whistles...The only minor complaint is it is very hard to scroll forward the track in stick mode. Anyway that can be tweaked a bit. You have to have your mouse just right to scan forward or it will default to the beginning of the track again. thx a lot for that bug report(if etwas one ). we will see what we can do to make this skin more userfriendly.